If there ever was one word that could represent the essence of Freud's work, that word would be 'unconscious'. 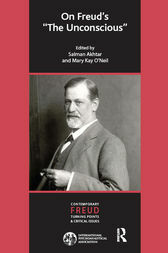 Indeed, Freud himself regarded his 1915 paper 'The Unconscious' as central to clarifying the fundamentals of his metapsychology. The paper delineates the topographic model of the mind and spells out the concepts of primary and secondary process thinking, thing and word presentations, timelessness of the unconscious, condensation and symbolism, unconscious problem solving, and the relationship between the system Ucs and repression. Examining these proposals in the light of contemporary psychoanalytic theory as well as from the perspective of current neurophysiology and ethology, nine distinguished analysts take Freud's ideas further in ways that have implications for both psychoanalytic theory and practice.